When TIME named the computer as the 1982 ”Machine of the Year”, it published a long profile of Steve Jobs as “the most famous maestro of the micro.” Ha! Great turn of the phrase, and that was long before he really moved out in pushing the envelope in micro electronics, consumer technology and human-focused design. When TIME named the computer as the 1982 ”Machine of the Year”, it published a long profile of Steve Jobs as “the most famous maestro of the micro.” Ha! Great turn of the phrase, and that was long before he really moved out in pushing the envelope in micro electronics, consumer technology and human-focused design. 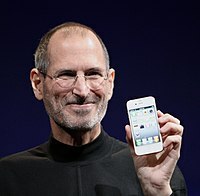 Steve Jobs changed the world and the lives of everyone in it. His death also teaches us other lessons. He was only 56. All his billions could not give him one more day on earth. As we honor his technological legacy I hope we all pause to honor his humanity and his own understanding that what matters is not how much money you make.